Jean has written to President Barack Obama, requesting the release of Private Chelsea Manning, the US Army intelligence analyst that has been imprisoned for leaking information about the conduct of America’s wars, including the shocking and infamous ‘Collateral Murder’ video. Jean’s letter asking Barack Obama to free Chelsea Manning. 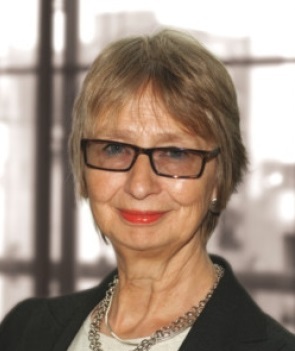 Jean was writing as part of Amnesty International’s annual Write For Rights campaign, which asks supporters to appeal to governments on behalf of twelve victims of human rights abuse, and to send Christmas cards or other messages of solidarity to the victims themselves. President Barack Obama, The White House, 1600 Pennsylvania Avenue NW, Washington D.C. 20500, USA. Chelsea E Manning 89289, 1400 North Warehouse Road, Fort Leavenworth, Kansas 66027-2304, USA. 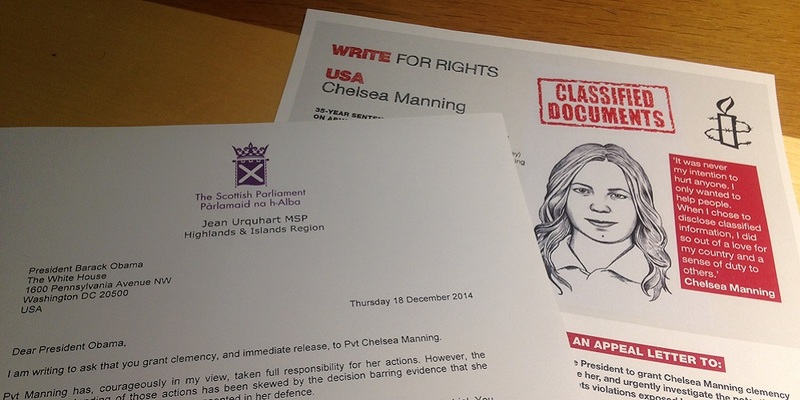 I am writing to ask that you grant clemency, and immediate release, to Pvt Chelsea Manning. Pvt Manning has, courageously in my view, taken full responsibility for her actions. However, the court’s understanding of those actions has been skewed by the decision barring evidence that she acted in the public interest from being presented in her defence. I am appalled by the conditions that Pvt Manning experienced in her imprisonment prior to trial. You will be aware that this treatment was described by senior military officials, including the judge in her trial, as being in breach of military standards, and that it was condemned by the United Nations Special Rapporteur on Torture as “at a minimum” cruel, inhuman and degrading. In your election campaign, you promised to protect whistleblowers, describing the disclosure of material that reveals abuse in government as “acts of courage and patriotism” which can save lives. The severity of the treatment received by Pvt Manning not only conflicts with this pledge, it discourages other potential whistleblowers from coming forward; it is good news for corrupt officials and bad news for public confidence in government. You were right to make that promise; I urge you now to fulfil it. Given these shortcomings in terms of due process and human rights displayed during Pvt Manning’s pre-trial detention and trial, and your election promise, I urge you to commute her sentence to the four-and-a-half years she has already served and release her immediately. In Scotland, as in countries around the world, there is horror and anger at the human rights violations exposed by Pvt Manning, and in the recently-published Senate Intelligence Committee report. We feel particularly close to these abuses because they were committed in the prosecution of wars in which our servicemen fought alongside Americans, and because the CIA’s rendition programme appears to have used Scottish airports. If America wishes to be seen even as part of the ‘free world’, it is essential that you urgently investigate the human rights abuses revealed by Pvt Manning and by the Senate report, and that you treat these not simply as historical events from which to move on, but as crimes to be prosecuted.